*Entrance fee the day after Labor Day to the Friday before Memorial Day is $5/NJ Resident and $10/Non-Resident. Take Route 37 east to Route 35 south to park entrance. Shaped by storm and tides, Island Beach State Park is a narrow barrier island stretching for 10 miles between the restless Atlantic Ocean and the historic Barnegat Bay. Island Beach is one of New Jersey's last significant remnants of a barrier island ecosystem that once existed along much of the coast and is also one of the few remaining undeveloped barrier beaches on the north Atlantic coast. Over 3,000 acres and 10 miles of coastal dunes remain almost untouched since Henry Hudson first described New Jersey's coast from the ship, the Half Moon, in 1609. Miles of sand dunes and white sandy beaches offer habitat to maritime plants and diverse wildlife that is almost the same as it was thousands of years ago. Island Beach contains outstanding examples of plant communities such as primary dunes, thicket, freshwater wetlands, maritime forest and tidal marshes. The state's largest osprey colony calls our park home and they welcome a wide variety of visiting birds including peregrine falcons, wading birds, shorebirds, waterfowl and migrating songbirds. Island Beach is nationally known as a unique resource with over 400 plants identified, including the largest expanses of beach heather in New Jersey. Island Beach State Park facilities are partially accessible for people with disabilities. The Fisherman's Walkway is a boardwalk that provides access to both the ocean and bay at parking Area 7. Beach wheelchairs for the ocean swimming area and beach wheelchairs that have been specially fitted for surf fishing are available at the pavilions during the swimming season and at the park office during the remainder of the year. Contact the park office for further information regarding disability access. Text telephone (TT) users, call the New Jersey Relay Service at (800) 852-7899. Providing enhanced amenities within the NJ State Park System has been a goal of the Christie Administration. Our state parks are an incredible asset to the citizens of the state and to all visitors to the park. Island Beach State Park is introducing a new amenity for visitors in the form of a new shore patio facility to provide alcohol beverages to adults 21 years or older. What is happening, where and when? The current food vendor at Island Beach is PPCF, Inc., also known as Chippy’s Fresh French Fries, located on the Point Pleasant boardwalk, and Jimmy’s Cucina in Brielle, a local business owner. PPCF, Inc. was awarded the food concession, with the agreement signed on 6/2/15. The DEP sought to bring the additional amenities to the Park and PPCF agreed to build and operate the facility. In addition to the alcohol service area, plans are underway to also upgrade and improve the Kitchen, Food Court, and the Food Service Area as well. The alcohol service area, which will have a total capacity of around 100 people, is the fenced in area on the west side of the Bathing Area 1 Pavilion (OBA 1). It opened in late summer 2016 and will operate seasonally only. Where can alcohol be bought and consumed? Will it be all over Island Beach? Alcohol will not be allowed outside of the fenced service area. Outside alcohol is prohibited, just as with other venues, events or restaurants that serve alcohol. As is the case now, alcohol is not allowed on the beach no matter where it is purchased. Bartenders have been trained and are being managed by PPCF in a manner in strict keeping with their ABC license and they will have the same responsibilities as other local businesses nearby the park’s entrance. IDs will be checked for every person ordering an alcoholic beverage just like any other such facility in the state of New Jersey. Current plans are that the alcohol service area will close at the regular park closing time. Why is alcohol service now being offered at Island Beach State Park, which is a popular family oriented state park? Adding adult alcohol beverage service in a controlled environment is another opportunity for visitors of legal age to enjoy an adult beverage while visiting the beach for a day. This service is no different than what is being offered along most of the Jersey shore at our boardwalks and elsewhere. Is the state park system now allowing alcohol to be brought into its state parks across the state? No. Bringing in outside alcohol by visitors to our day use areas and/or overnight facilities remains prohibited. Alcohol will only allowed in our state parks if within a properly ABC licensed facility that has DEP’s permission to be serving alcohol or if an organized event has been approved and permitted by the DEP and ABC. Is this the first facility to be operating in the NJ state park system that serves/sells alcohol? No. We currently have restaurants that serve alcohol in our state-owned golf courses and at Liberty State Park, Waterloo Village and Skylands Manor at Ringwood State Park. All of these operations have been successful with no ABC violations. The new venue at Island Beach State Park will include food service also. What control measures will be in place to ensure no disorderly conduct by patrons? Our Concessionaire, PPCF, Inc. at Island Beach State Park will have this new service in a fenced in area on the west side of the OBA 1 pavilion and will not be allowed outside of the fenced area. Alcohol can only be ordered and consumed within this fenced area. ID’s will be checked for every person ordering an alcoholic beverage. PPCF will need to comply with the highest standards set by ABC for alcohol sales and consumption. All bartenders and staff will be properly trained and finger printed. PPCF will provide any additional security that may be needed. State Park Police at Island Beach State Park will assist if needed for emergencies. Will the new venue at Island Beach State Park be operated under more “green” standards – such as requiring recycling of cups/cans/bottles? DEP will recommend to the Operator to use “green” products where it can and to maintain a beach/eco-friendly atmosphere in the venue area and recycle where it can. Will this new service impede access to the mobile sport fishing area at Island Beach State Park? 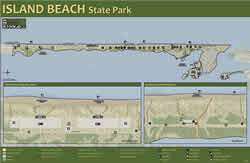 In order to enjoy the facility, visitors will have to pay the entrance fee to access Island Beach State Park but there are no additional special fees related to the bar area. Estimated seating capacity at the ABC Premise at OBA#1 is around 100 when fully constructed. The bid proposal set the cost of upgrading the Kitchen, Food Court, Food Service Area, Dunkin Donuts (not yet installed) and ABC Premise at between $230,000 and $280,000. tion, the operator is permitted to serve alcohol in a section of OBA#1 subject to DEP approval and upon receipt of an ABC permit. The Operator is subject to all ABC rules and regulations and inspections. If he leaves, what would a new vendor need to continue the operation? All permanent improvements to the Operating Premise are the property of DEP. Such as air curtains, utilities structural changes, new service windows fencing. The Operator owns all new or replacement equipment unless permanently attached such as walk in freezers. Upon vacancy the DEP would offer the premises under an open public bidding process. 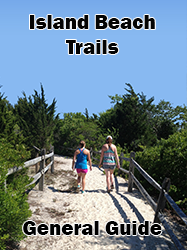 The Island Beach State Park Discovery Trails System provides a self-guided experience through the nine plant communities of a barrier island. Wayside exhibits located along each trail interpret the natural and cultural stories of the park. There are a total of 8 trails, each under one mile. For a copy of the Discovery Trails brochure and map, please contact the Park Office. 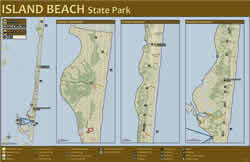 Horseback riding is permitted at Island Beach State Park from October 1 through April 30. There are six miles of ocean beach in the southern and central portions of the park available for equestrian use and a parking area is designated for horse trailers during this time period. Reservations are required by contacting the park office at (732) 793-0506. Ten miles of pure white sand beach attract swimmers, sunbathers, anglers and surfers. Modern bathhouses, beach access ramps, a mile of beach with lifeguards, historic buildings, trails, interpretive programs, bike paths and facilities for people with disabilities combine to make Island Beach a unique place to explore. The bayside of the island is a nutrient-rich feeding ground for birds, fish and other wildlife. Naturalist guided canoe and kayak tours during the summer months take participants through the Sedge Islands where they can observe a wide variety of wildlife, including nesting ospreys, falcons and wading birds. Bird observation blinds give visitors the opportunity to view the wildlife in this very important habitat. Together, these two natural areas encompass one of the few remaining undeveloped barrier beaches in the northeast United States. Rolling sand dunes, salt-sculptured vegetation, lush green salt marshes, and nine plant communities including a nationally significant maritime forest characterize Island Beach. The federally threatened piping plover is an occasional inhabitant of the open beaches and dunes. Access to portions of the Northern Natural Area is restricted. Please note: Special use permits are subject to review and approval by the park. Island Beach State Park is well known by New Jersey's saltwater anglers for excellent surf fishing for striped bass and bluefish. Other species include summer flounder and weakfish. During the appropriate season, fishing for tautog along the north jetty of Barnegat Inlet is especially rewarding. Bait and fishing information may be obtained at local tackle dealers before entering the park. Saltwater fishing is subject to New Jersey Division of Fish and Wildlife and State Park Service regulations. Information regarding saltwater fishing regulations can be found in the Fish and Wildlife Digest, which is available at local tackle dealers. Access to fishing in the park is open 24 hours a day. Mobile Sportfishing Vehicle permits to operate 4-wheel drive vehicles on the fishing beaches may be obtained at the Park's Visitor Contact Station at the entrance gate. Issued decal should be treated as cash. It will not be replaced if lost or stolen. The SPS will continue to offer a replacement decal for $25, only upon presentation of paid receipt and the old decal, regardless of the condition. Will be issued only to the registered owner of the vehicle – the name on the license and registration must be the same. Leased vehicles must bring their lease paperwork. Company owned vehicles must show proof of ownership. A business card will be accepted, as long as it states “owner” or “president”. All documents must have a current, valid date. You must apply for the MSFV Permit in person at the Island Beach gatehouse. You will be asked to present original vehicle registration, driver license and lease documents. Permits are issued to 4-wheel drive vehicle owners for fishing purposes only. Carrying the basic equipment listed is required whenever the MSFV is on the beach. 11) Minimum of 1/4 tank of fuel. A current tide chart is highly recommended. Jumper cables for the vehicle's specific battery type are also recommended. Swimming is only permitted when lifeguards are on duty from 10 am to 6 pm. Approximately one mile of designated ocean bathing beach is located in the central portion of the park. During the period from mid-June through Labor Day, this bathing beach is staffed with lifeguards who are trained in ocean lifesaving and first aid techniques. Please check our swimming schedule prior to your visit. Nearby are parking areas and bathhouse pavilions with changing areas, first aid stations, and concessions. Personal Flotation Devices are not permitted to be used in the Ocean Bathing Areas. A new lifeguarded swimming area will be open this summer season near A-7, north of the Fisherman’s Walkway access point. A $3 walk-in fee (free for children under 3 years old) will be assessed for those who enter the park at Fisherman’s Walkway adjacent to Tices Shoal while lifeguards are on duty. Although tables and grills are not available in the park, visitors may enjoy picnicking on the ocean beach. Grills may be used on the beach south of the designated bathing area. Fires must be at least 50 feet east of the dunes, and picnickers are required to extinguish their fires before leaving the area. Island Beach State Park requires visitors to "Carry In/Carry Out" their garbage. A designated bicycle path is located along more than 8 miles of the main road. Six miles of ocean beach in the southern and central portions of the park are available for equestrian use from October 1 through April 30. A parking area is designated for horse trailers during this time period. There are no horse rental facilities in or near the park. Please contact the park office for further information. From Memorial Day Weekend through the first of October, pets are not permitted on the Ocean Swimming Beaches (lifeguarded areas). Pets are permitted South of the Ocean Swimming Areas during this time period but must be held on a leash (maximum length - 6 feet) and you must clean up after your pet. Pets are not permitted on the Spizzle Creek Bird Blind Trail at any time. Portions of the ocean beach at the extreme southern end of the designated bathing area have been set aside for sailboarding and surfing. For further information, please contact the Park Office. 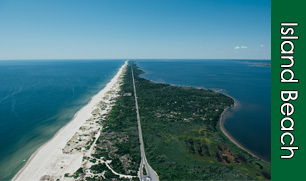 Scuba diving and underwater fishing are permitted along 2.5 miles of ocean beach just north of Barnegat Inlet. Scuba divers must register at the park office just prior to their first dive each year. Proof of current diving certification is required. Spear and underwater fishing are subject to New Jersey Division of Fish and Wildlife regulations. Diving in Barnegat Inlet is permitted and subject to New Jersey Boating Commission Special Regulations. 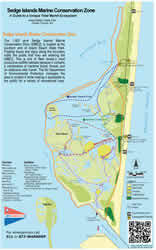 Island Beach State Park's natural sand dune formations and relatively undisturbed vegetation create a unique outdoors experience to study a barrier island ecosystem. School groups that are interested in visiting the Park for self-guided tours must make advance reservations. For more information, please call the Park Office at (732) 793-0506. The Sedge Island Marine Conservation Zone contains approximately 1,600 acres of highly productive tidal marshes, creeks, ponds, and open water. The purpose of the Conservation Zone is to protect and interpret the wildlife resources while reducing user conflicts and maintaining the traditional uses of the area. Canoe and kayak tours are offered by Park's interpretive staff. For more information regarding the Conservation Zone, please contact the Park Office. The Emily DeCamp Herbarium is a collection of approximately 400 plants that have been classified and preserved, giving the public an opportunity to learn about the nine plant communities at Island Beach State Park. One of the main attractions of this herbarium is that the visiting public and scientists are able to handle and examine individual plants. Plants have been placed in a protective mount that also gives historical and factual information about the plant. The herbarium is kept at the Forked River Interpretive Center. Two Coast Guard stations from 1901 and 1938; New Jersey's largest osprey colony. Excellent location to study barrier island plants, see a red fox or observe migrating birds in May and October. Surf chairs and ramps at Ocean Beach Area-1, Ocean Beach Area-2 and Area-7 to assist people with disabilities to fish or reach the water's edge.